Product #21525 | SKU QNS113 | 0.0 (no ratings yet) Thanks for your rating! The black 13.3" Laptop Sleeve from Case Logic is a thin profiled, thickly padded sleeve made from a tough moulded EVA (ethylene vinyl acetate) that gently supports and cushions your computer while it's safely nestled inside. The quilted material is enhanced with built-in airflow channels to minimise any possibility of your computer overheating. The unique clamshell design offers you the opportunity to use your laptop while it's still in the sleeve. That will come in handy while you're on the train, bus or aeroplane. Just unzip the sleeve, lift up the top half, and use the bottom half as a platform on which you can type or view videos. It's carried by its two top padded carry handles. 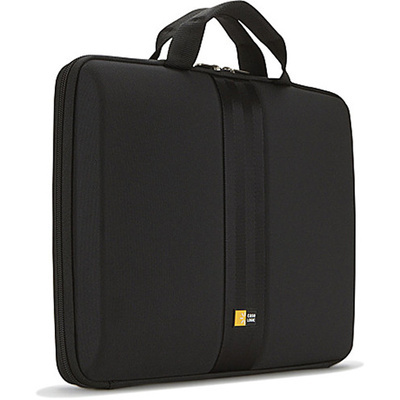 Case Logic backs this sleeve with a 25-year warranty.